I'm sure every reader knows the feeling of starting a book you're skeptical about and being pleasantly surprised. Empire in Black and Gold was that and so much more. I had continually pushed it down on my TBR list because the whole insect idea just didn't click with me. Eventually I caved thinking that what if it ended up being a gem? Tchaikovsky writes pretty damn fast for a new-ish (I know '08 isn't that new but still) author whom not a ton of people know about.The human race is divided into several different insect-kinden and each kinden has an Ancestor Art. From what I gather, we have Beetles who tend to be more stout than the others, but also more resilient, with very rare encounters of flying Beetles, and even then they're bad at it. The Beetles are one of the Apt races, those of whom can use technology and their Art allows them this resilience to several things. Dragonflies are gold of skin and can fly and are much more dextrous and quick than other races (but Inapt) and have weapons called 'thumb claws' that are explained in the book, Wasps can fly and 'sting', meaning their Art allows them to shoot what is essentially a ball of fire from their hands. Flies are much smaller than others, Mantids are deadly warriors, the list goes on and Tchaikovsky does a great job explaining them.The action is very well written and keeps coming, and the dialogue is great. I cannot comment on prose due to the fact that I'm still not 100% sure how to categorize it. The basic plotline is that Stenwold, a Beetle, has been preaching to everyone for 17 years of the imminent Wasp threat, but nobody has listened. The Wasps continue to move and mobilize, and he is laughed at. The cast has many likable characters and their development is also top-notch.The electronic version finished at 86%(567 or so pages on the PaperWhite), which was strange, but included several little short stories not relevant to our cast that I'll get around to eventually. There wasn't a crazy cliffhanger like GRRM has done and PVBrett has done as well, but there is definitely motivation to read more. 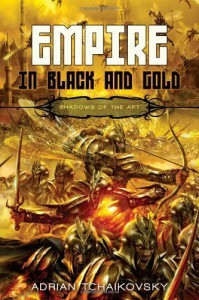 Most first novels in an epic fantasy-esque series tend to be set-ups, and Adrian did a brilliant job setting up the series, but with some added POW.All in all this was a fantastic debut and I'm very pleased that I am able to dive right into Dragonfly Falling and subsequent ones without waiting. Provided that I whittle down Mount TBR a bit between books.5/5 and really looking forward to more.